If we aren't careful, that itsy bitsy little thing called a mobile phone will be the death of us. We are all guilty of misusing it, yes, even me. Getting control of it is something we all have to learn. For Pete's sake we should be controlling it and not the other way round. For me, it doesn't held my introverted nature either 'cos I just turn to my phone when I'm too shy to speak or don't know anyone around. When this article turned up on Shannon's blog, I knew she had me in mind. Upon reflection recently, I began to consider those relationships in my life in which I felt a strong, sincere bond. And I began to recall how our time is spent together. In each instance, whether it was a family member, a friend or a colleague, the person had chosen to give their full, undivided attention. Very rarely, if ever, had a cell phone been visible, let alone been used during our time together. On the flip side, those individuals with whom a connection, while attempted, just didn’t seem to occur, often held in their descriptor as the presence and frequent use of a cell phone. Granted there were other factors as well, but this was a common detail. So I began to wonder, since cell phones are only becoming more ubiquitous in our modern tech world, how can we become the master of them? After all, cell phones, smart phones, tablets and any type of technology that has become integral to our everyday lives is an impressive tool, but we must choose to use it effectively, otherwise it can do more harm than good. Just as scissors in the hands of a skilled hair stylist can craft magic with any type of tresses; in the hands of a novice, the results can be devastating and take months to rectify. As someone who is quite reliant on her smart phone, I will readily admit that I need to become more self-disciplined when it comes to how I use it. Unlike many life skills (driving, cooking, compassion, just to name a few) which are learned and observed from the generation before us, how to use a cell phone in public respectfully and appropriately is something we are all learning as we go. And while it may seem the rules change, they really aren’t. Referencing the quote at the top of the post, even if you don’t know the people in the room of which you are standing in, if your talking may make them uncomfortable or be distracting, common sense would nudge you to allow the call to go to voicemail or step outside to take it. 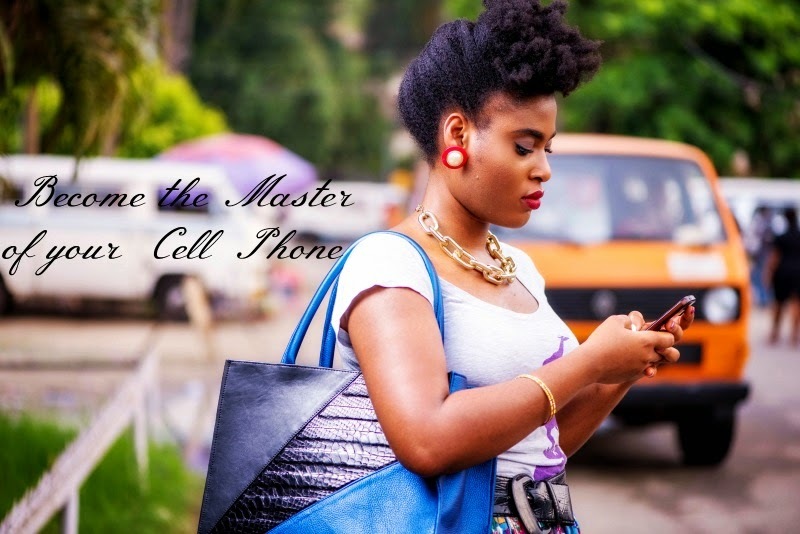 But before we dive into mobile manners, I’d like to take a look at the many benefits and drawbacks of having cell phones in our lives. David Brooks wrote a thought-provoking op-ed earlier this month which speaks to the detriment of cleaving to newly college students by their parents, and how this separation is vital for the child to mature into a healthy adult. Sadly, if our instant communication abilities are used ad nauseum, a parent may be doing more harm than good by staying in constant contact. With so much of our lives stored on our smart phones, if lost, a once absent-minded moment can flip our lives upside down and cause unnecessary stress, angst and potential loss of money. When it comes to respectful use of our cell phones in public or around people, an ironic finding was discovered by a recent Intel study. Eighty percent of Americans surveyed said they were annoyed when they saw in appropriate use of our tech gadgets; however, 77% of people admitted to doing it. So why do we persist? The same study found that 92% wished people would practice better cell phone etiquette, so why don’t we? Perhaps it comes back to the foundation of what we know is proper. Sometimes it really is easier to recognize it in others than it is in ourselves. After all, if our spouse calls or our child, we rationalize taking the call because they hold an important place in our lives, but here’s the catch. The people around us are affected by our decision, and we must take into consideration that we aren’t making a decision that only affects us. Granted, if it is an emergency, that is different, but if your child, parent or friend simply needs to hear your voice, there is voicemail or texting. While simply adhering to the simple advice of being aware of how our use of technology impacts those around us, sometimes we need more. Sometimes we need to be reminded, and sometimes, we honestly were never taught and simply didn’t know. After all, we weren’t born with a cell phone attached to our ear. Knowing how to effectively and respectfully use it to foster healthy, thoughtful relationships is a learned behavior, so here we go. 1. No driving while using a phone or any tech gadget. 3. If you must have your phone on you, switch it to silent or vibrate and leave the room should you need to take a call. 4. Give the person in your physical company your full attention. Refrain from texting someone else while talking to someone in person. The behavior, whether intended or not, signifies who is more important to you at that time. 5. Be mindful of volume and voice projection. 6. Refrain from placing your cell phone on the table. 7. Allow voicemail to do what it was designed to do. Trust it; it works. 8. When leaving a voicemail, keep it short, but express why you are calling. A simple “call me” is ambitious and leaves the responder uncertain of how dire or necessary their attention is to the situation. 9. Don’t make people wait while you finish a phone call. End the phone call away from others before engaging or when you might be expected to engage (check out counter, bank teller, etc). 10. Use speaker phone respectfully. Ask the person if you can put them on speaker phone and/or let them know when you are on speaker phone. 11. Do not share personal details in public. 12. Respect the Ten Feet Rule. If you can’t leave the room to take the call, and must take it, step away from others, at least 10 feet or more if possible. In 2012 a study conducted by the Journal of Social and Personal Relationships reported “the mere presence [of our cell phone] paradoxically holds the potential to facilitate as well as to disrupt human bonding and intimacy.” We can master these amazing devices if we choose to. Often, as I observe my teenage students, I am quickly reminded how cell phones are an escape, a safe place to go when we feel uncomfortable or are seeking validation. It takes a strong, secure person to put the phone away and walk with their head up into a room of people they don’t know. It takes a strong, secure person to look someone in the eye and have a conversation with them and perhaps be vulnerable. To allow our modern advancements to cause us to regress rather than progress toward a better life is something we must own because the device doesn’t have such a significant power unless we give allow it to be taken from us. Time magazine shared a study by the Journal of Personalities which revealed that self-control is as much about avoiding temptation as it is about finding ways to not be tempted in the first place. Put into practice habits that release you from making the decision of reaching for your phone. When you’re driving, leave it in your purse; when you go to the meeting, leave it in your locked office; when you are having dinner with your significant other, turn it off completely. If your relationships are a priority to you, refuse to allow the minor alerts, pings, rings or tweets that naturally will draw your attention away, interrupt an intimate conversation. There is a silence option on your phone for a reason. Use it. Boundaries not only for yourself, when you and where you can use your phone, but also boundaries for others to learn to respect as well. Often we have to teach our boundaries to others as they will proceed based on what they allow in their own lives, but until we make it clear what we need, they will continue to cross the line. We teach people how to treat us and respond to us. Use the Do Not Disturb option on your phone, pre-set for a certain amount of hours each night. Allowing only your “favorites” to ring through, you are assured that you won’t miss something you should and you’ll be sure to get a restful night’s sleep. Turn off the unnecessary notifications. Select apps that monitor your phone usage: Moment,Breakfree, and Calm. Again, the key is you. What will you allow? As of January 2014, the Pew Research Center shared that 90% of American adults have a cell phone and 58% adults have a smartphone. These numbers only reflect adults, and we know many children and young adults have them as well. Even if we feel our behavior is unobtrusive to others, what we model speaks volumes to how and when a cell phone can be properly and respectfully used. I am by no means perfect, and often find myself breaking one or two of these rules from time to time. But just as the first study I shared at the beginning of the post revealed, I will admit to getting slightly agitated when people around me aren’t aware of their disturbance to others when they use their phone in a public place that is asking for calm, quiet or our full attention. We may each be a small ripple in a grand ocean of our technology-loving society, but it has to start somewhere. Why not with us?